ABBOTSFORD – Community and academia joined forces at “Town and Gown”, the University of the Fraser Valley’s inaugural fundraising dinner and silent auction held on Nov 12 in the Great Hall of UFV’s new Student Union Building. More than 230 people attended the gala. The evening raised $40,000 in support of scholarships for UFV students. 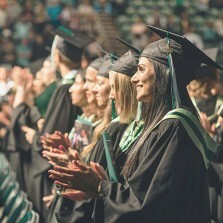 He noted that the Fraser Valley community has supported UFV throughout its four-decade history. UFV and the UFV Alumni Association recognized two outstanding alumni at the event. Dr. Mike Hildebrand, now an assistant professor at Carleton University in Ottawa, was named Distinguished Alumni for 2015. Alex Reimer, an electrician who runs his own business and serves as an electrical inspector, was named Young Distinguished Alumni. Nik Venema, chair of the UFV Alumni Association, introduced the award winners. Hildebrand thanked UFV for setting him on the path to his dream job as a professor with research and teaching duties. Young Distinguished Alumni Alex Reimer said that he has no regrets about starting his university education while still in high school through a special partnership between UFV and the Abbotsford School District. Two current students spoke at the event. Sophie Smit first met President Mark Evered at her high school awards ceremony as he was presenting her with the President’s Entrance Scholarship, and he complimented her on her Converse all-star shoes. Thomas Davies, president of the Student Union Society, welcomed guests to the new SUB building and cited it as example of what students can accomplish when they put their mind to it. President Mark Evered also shared success stories about several special guests he hosted at his table including Smit, Davies, basketball standout and mental health advocate Jasper Moedt, Sukhi Brar, Sasha Moedt, and Sasha Morneau, who overcame several health obstacles in completing her degree and then received a marriage proposal on stage during convocation last June. 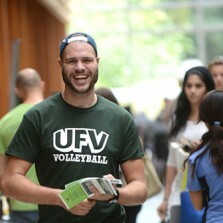 David Leis, UFV director of advancement, was very pleased with the community response to the first Town and Gown event. The gold sponsor for the Town and Gown fundraising dinner was Chernoff Thompson Architects, who designed the new Student Union Building that served as the location for the event. Silver sponsors wereEsposito Group, Impark, the UFV School of Criminology and Criminal Justice, and Minter Country Garden Store. Media sponsors were the Abbotsford News and The Patrika. Leader Frames and Save On Foods also provided support to the event.